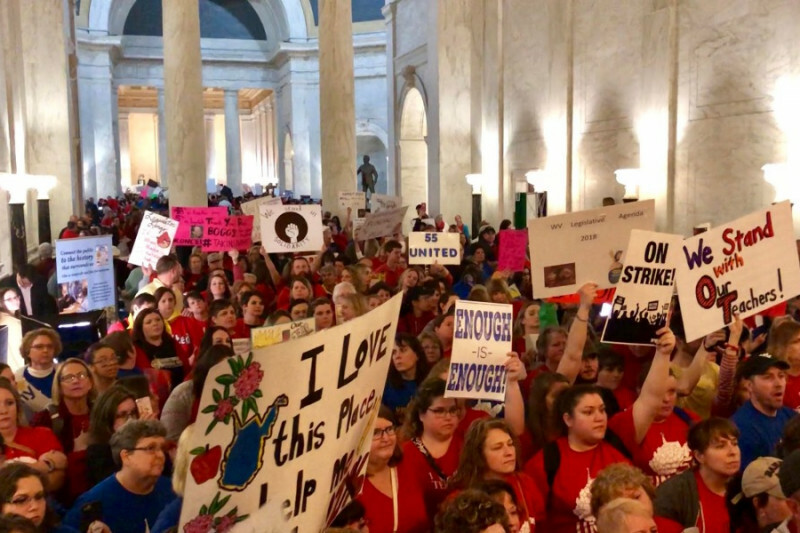 West Virginia's public school teachers have walked out en masse in a wildcat strike, demanding an end to decades of real-terms wage cuts that have left them among the poorest-paid teachers in America, as well as skyrocketing health insurance costs. Despite struggling with poverty themselves, West Virginia's teachers have taken it upon themselves to feed their hungry students, who suffer under a state welfare system that treats poverty as a moral stain and deliberately starves families whose lack of employment, or lack of hours in low-waged, precarious work. West Virginia is one of a number of states that prohibits public-sector strikes; this, combined with falling state revenues (attributable to sweetheart tax deals for the energy sector) has allowed Republican state legislators to make up budget shortfalls on the back of public sector workers. The state has taken steps to settle the strike, promising wage increases but not help with the insurance; this deal has yet to be fully ratified by the legislature and may yet collapse. In the meantime, the wildcat nature of the strike means that the teachers have not received any strike pay [Update: at least some WV teachers are still being paid out of county 'snow day' funds]. A Gofundme page is soliciting donations to help teachers pay their mortgages and other bills while they stay out on the picket line, demanding fundamental justice. I donated and I hope you will, too. The WV Teachers Strike Support Fund is a public fund, started by a few West Virginians, to help support teachers and school service personnel who are taking on great personal cost to organize and support their families during the strike, and beyond. This is not a union-sponsored fund, and we do not expect to raise enough money to supplement lost salary or wages. This fund is proud to be associated with RiseUp WV, a grassroots citizens organization based in Charleston, West Virginia.